test has reached Class 7 (300Pa). Above Class 7, the pressure is increased in increments of 150Pa every 5 minutes and the test continues until it reaches the prescribed standard or until the window or door leaks, whichever is sooner. Above Class 9, the final performance is not shown as class 10, 11 or 12 etc. Instead it is designated using an E followed by the maximum pressure (in Pascals) achieved. For example, a door that withstood 900Pa, would be given class E900. This test measures the volume of air that would pass through a window or door at a certain pressure. Performance levels are grouped into four ‘classes’ where class 1 is the lowest level of performance and class 4 the best. and Energy ratings. Each of these measures requires more explanation, and so this is the subject of a separate guide (number 3). This is a test of the door or window’s structural strength and ability to keep out the draughts even in the windiest weather. The test involves gradually increasing the air pressure to simulate wind force and then measuring both the extent to which the window or door bends (deflection) and the point at which the draughts start to get through (maximum test pressure). Performance levels for deflection are grouped into classes A, B and C, where A is the worst and C is the best. Performance for maximum test pressure is grouped into 5 classes, where class one is the lowest performance and class 5 is the best. A class 5 window or door can withstand 2000Pa of pressure, which is the equivalent to 127mph winds. To put this into perspective, on the Beaufort Scale, when the wind exceeds 74mph it is classed as a force 12, which is hurricane force. 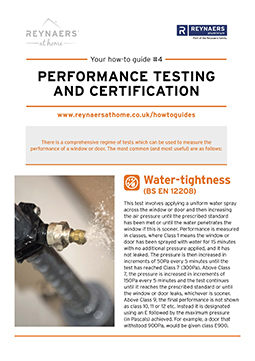 PAS 24:2012 is a British Standard publication that requires a window or door to achieve a minimum standard of performance. This UK approach is based on a number of methodologies that combine human intervention with dynamic testing and where appropriate, soft and hard body impact testing. The human intervention element is tested using an agreed set of tools that is designed to replicate those of an opportunistic burglar. For example, pliers, wrench, chisel, paint scraper, Stanley knife and screwdriver. In other tests mechanical loading is applied as high as 4.5kN (which equates to 450 kilos of force) for 10 seconds at strategic points across the window or door. In addition, the locking cylinders, handles and letter boxes on doors will also need to pass some further tests. Windows will also need to be glazed according to some specific standards. Secured by Design is an organisation owned by the Association of Chief Police Officers whose mission it is to reduce crime by making homes and commercial premises more secure. As a part of this initiative, they have their own accreditation scheme for products that can enhance a property’s security, including windows and doors. In order to be awarded this accreditation, the windows and doors must comply with the standards of PAS 24:2012, (as outlined above) and in addition must have been cycle-tested to be opened and closed, locked and unlocked thousands of times. Air, wind and water is also looked at as part of the Secured by Design accreditation. European standard EN1627-1630 subjects the window or door to a variety of static and dynamic loads whereby, for example, the opening part of the window or door may be pulled sideways to try to disengage the locks while also being pulled outwards. The test also includes simulated attempts to break in using specified tools. In this standard windows and doors may be categorised into six classes RC1 to RC6 though only RC1 to RC3 apply to domestic use.